In part one of this series we covered many of the fundamental tasks of Twitter, and in part two we addresed basic techniques and workflow management. As you gain more experience with Twitter and grow more confortable using it as a platform for sharing and conversation, you may find you need better organization techniques and more advanced tools. Dashboard applications present linear, chronological streams. If you prefer a more reader-friendly format in terms of information browsing, you should consider other options. Paper.li, Zite, Twylah, Summify, and The Tweeted Times are all applications with easy to read interfaces featuring the most popular items of the day, as shared by members of your social network. 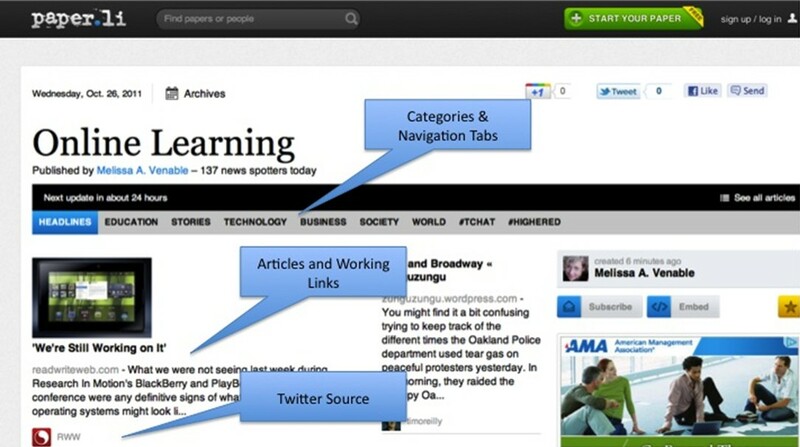 These tools aggregate links in one place, display images, and categorize the information for easy scanning. Establishing an account includes opening a link to your Twitter feed (or other social media account, as applicable) and configuring the customization options in terms of categories, keywords, screen layout, color, etc. The result is a custom user interface crafted to your specifications. You’ll find headlines, article snippets or previews, links, and navigation menus that cycle through periodic updates (e.g., every 24 hours). 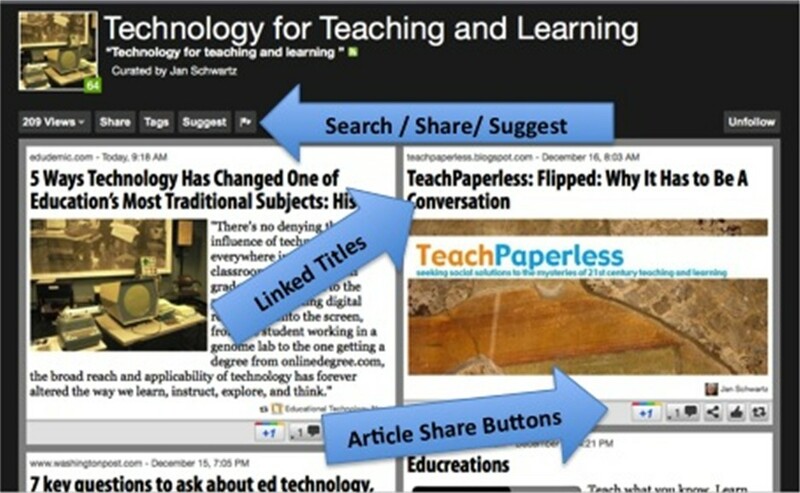 The Instructional-Design Daily via Paper.li: Greg Williams, an instructional designer and eLearning developer, regularly posts a link to his news collection via Twitter. Clay Shirky via Tweeted Times: A collection of links and stories presented by author and professor Clay Shirky. Daily Career Guide via Paper.li: This career-related collection is published by Stevie Puckett, a career counselor and web developer. 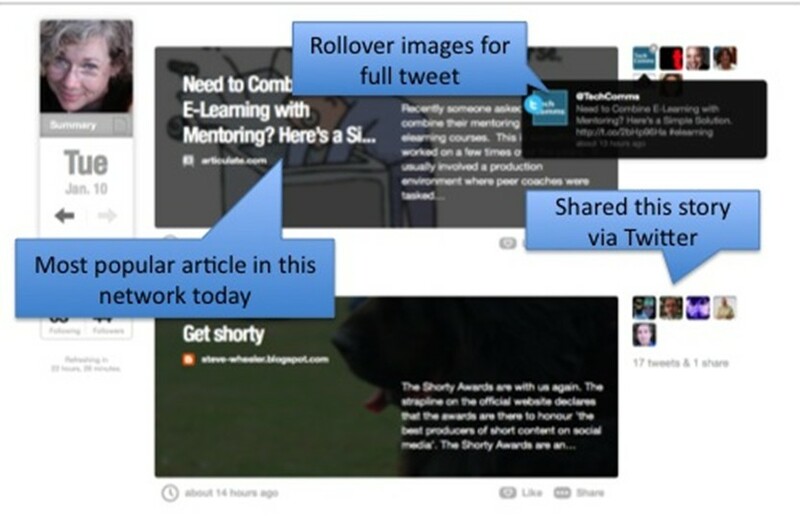 Paulo Simões via Summify: This elearning professional shares the top ten stories from his Twitter stream. Technology and media journalist Tom Foremski defines curation as “… a person, or group of people, engaged in choosing and presenting a collection of things related to a specific topic and context” . Each of the management applications listed above offers a convenient way to curate resources. Scoop.it and Storify are just two examples of curation applications that pull resources not only from Twitter but from other networks as well, such as Facebook, YouTube, and Google+. Additional URLs can also be contributed to these collections. Mobile Learning via Scoop.it: This collection is managed by Judy Brown, a mobile learning strategic analyst currently working with the ADL Immersive Learning Technologies Team. Babson College Orientation via Storify: Information about undergraduate orientation events for the Class of 2015. Social Media Content Curation via Scoop.it: Managed by Giuseppe Mauriello, a freelance social media consultant, this collection presents content that addresses the curation of online resources. You can choose to follow or subscribe to these curated collections, suggest new items to the curators, add your own comments to the posted items, and share the items you find to be most helpful via your Twitter account. You may even want to start your own collection. The considerations for selecting a dashboard tool also apply to reading and curation applications. Make sure the system you choose will work well with your social media accounts and devices, and offers the features and functions that make accessing the information easier for you. Please consider contributing your tips for reading and curating in the comments area! Next up: Part 4 – Participating in a Live Event. Hi Paulo- You’re very welcome! Thanks for helping to curate all of this information and for sharing it with the rest of us. Wonderful summation of how to read Twitterfeeds in a meaningful way: taming the chaos. Hi Sara! Thanks for taking the time to reblog this post and comment. So glad you found this information to be useful.